I recently had the chance to soak in the awesomeness of the Mexican capital city for a handful of days. Friends had shared their overwhelmingly positive stories and I was expecting big things. This charming city did not disappoint. With a staggering 21.2 million people in the metropolitan area, CDMX (as it is known) digests influences from around the world. When 2018’s World’s 50 Best Restaurants list was announced recently, Mexico City had 2 restaurants in the top 20. One more than either New York, Paris, or London. That’s a big deal. Add to this, that in 2017 Licorería Limantour was awarded 14th best in the World's 50 Best Bars. Wandering around the lush art deco neighbourhoods of La Condesa and Colonia Roma, you feel like you’re a world away from the craziness of Centro Histórico. Breaking from the serene, it’s also fun to join the crowds on Calle Madero and be carried along with the tide. Throw in some amazing history and the art of Diego Rivera and Frida Kahlo, and Mexico City stacks up pretty impressively. To top it off, Mexico is home to one of the greatest spirits in the world: Mezcal. Mezcal is the iconic spirit of Mexico. Made from the roasted piña (heart) of the agave plant, the name derives from the Aztec words for cooked maguey (agave). The Aztecs were already drinking Pulque, a milky fermented drink made from agave, prior to the arrival of the Spanish. It was “the elixir of the gods”. It is still debated whether it was the Spanish who introduced distillation when they ran out of their supply of liquor brought with them from Europe. Today, Mezcal production in the states of Oaxaca, Guerrero, Durango, San Luis Potosí, Puebla and Zacatecas continues much as it has for the last 200 years. 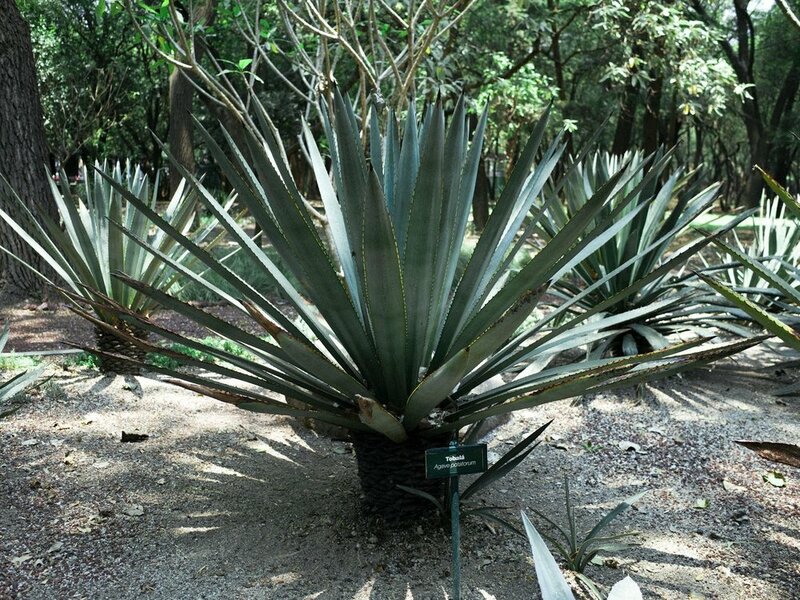 Unlike Tequila - which is made solely from blue agave, Mezcal can be made from 30 different types of agave. Small scale distilleries, known as palenques, hand harvest the plants, extract the piñas, and roast them in earthen open pits for 3-5 days. They are then ground by hand or stone wheel and fermented in concrete or wooden vats. Twice distilled in copper or clay stills, Mezcal can have an alcohol strength of 36% to 55%. We would suggest shooting for 45% and up when purchasing a bottle of Mezcal. Whether flying solo or in a cocktail, there are a few things to consider when drinking Mezcal. One, the Mezcals you want are unaged or Joven. Mezcal does come in Reposado (minimum 2 months oak ageing) and Añejo (1 year oak ageing), but many would argue that barrel ageing masks Mezcal’s natural smokey and vegetal character. Two, do not shoot it! What a shame it is to pound back Mezcal without savouring all of its nuances. In Mexico City’s Mezcalerias it’s served in short veladoras glasses that resemble little candle holders. Sipping Mezcal you can unravel many levels of aromas and flavours ranging from notes of smokey wet earth and anise, to citrus and dried fruits. Lastly, try as many types as possible. With so many varieties of agave and small producers, Mezcal is one of the last truly artisanal spirits. For first time drinkers, we would suggest picking up a bottle of the Siete Misterios Doba-Yej Mezcal ($52.50). It is crafted from wild agave Doba-Yej (the Zapotec word for Espadin Agave) from Santiago Matatlán and San Luis del Rio in Oaxaca State. Siete Misterios was founded in 2010 with the purpose of preserving traditional Mezcal production and supporting small local producers, known as mezcaleros. The Doba-Yej was their first Mezcal produced in a copper rather than clay pot-stills. Milling is done using an old fashioned horse-drawn mill called a tahona. Each batch is made by a different mezcalero. This is one the most popular Mezcals that we carry, and is ideal for both sipping and mixing in cocktails.